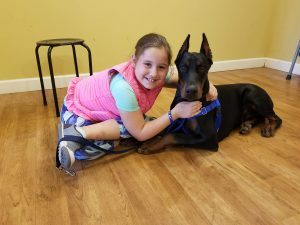 As both a mom and a former elementary school teacher, Rebecca values the importance of keeping children safe around pets by teaching them to understand the ways that dogs communicate. In an effort to do this, Love Them Train Them LLC offers multiple avenues to educate both parents and children. Is it stress or a smile? Most people can’t tell the difference! This seminar is offered for adults in partnership with Dr. Jenny Biehunko DVM of Veterinary Behavior Consultants of Alabama. The next step after educating parents is to educate the children! Topics include how to know if a dog want to be petted, why dogs bite, and what to do if a stray dog approaches. In three one-hour sessions, children will learn bite prevention techniques, how to recognize resource guarding (and how to respond), and how to read body language.